BARTON Watch Bands - Top Grain Leather Quick Release Straps feature integrated quick release spring bars and an ultra-smooth underside. Fabricated from hand selected leather and 316 stainless steel. Quick release spring bars make it easy to swap straps in a matter of seconds without the need for tools. Buy multiple and swap regularly to compliment your wardrobe or mix and match with BARTON's silicone quick release bands to take your timepiece from the workplace to the gym. Compatible with any watch (traditional or smart watch) that uses standard 16mm, 18mm, 20mm, 22mm or 24mm spring bars. To determine proper width for your watch, measure the width where current band attaches to the watch head. They will also fit hundreds of other traditional watches with standard 16mm, 18mm, 20mm or 24mm lug widths. 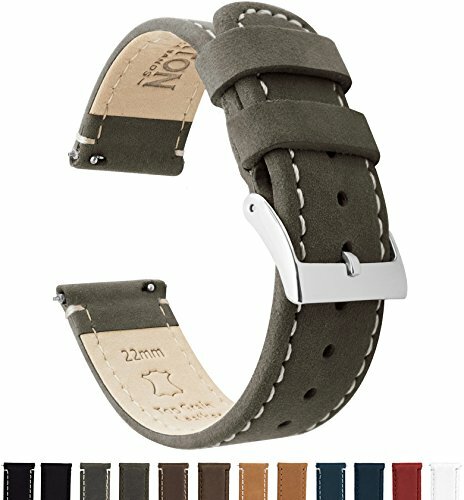 If you have any questions about this product by Barton Watch Bands, contact us by completing and submitting the form below. If you are looking for a specif part number, please include it with your message.